My inspiration for this month's whimsy comes from one of the fluffiest and most adorable breeds of little pup, the Scottish Terrier. I haven't been in a dog-owning household since we left our golden retrievers behind in America, when I was seven years old. They were bigger than me, and could bowl me over completely, but I don't think that bothered me at all. Despite being more of a cat-lover, when it comes to my personal pet preference, I do love dogs too. And I have always liked Scotties. In fact, a very scribbly fluffy Scottie was the main character in a little comic strip I (very) briefly drew when I was about 11 years old. 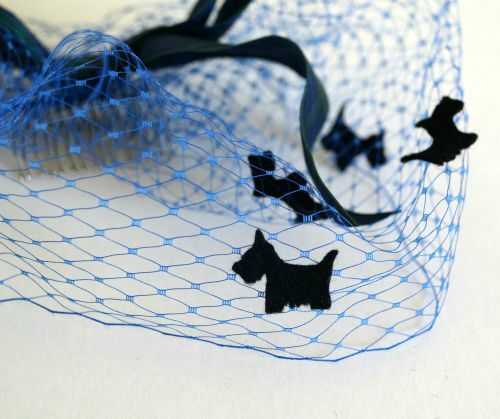 Strangely, in all my brainstorms of possible whimsy themes, I hadn't considered Scottie dogs, but once the idea was in my brain, I couldn't make it fast enough. And I knew I had this ribbon, with the Black Watch tartan pattern, in my ribbon box, just waiting for an opportunity like this. 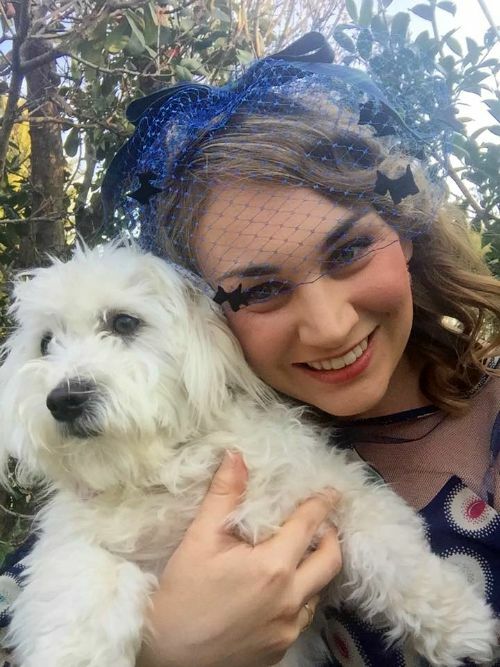 Mel's Maltese puppy doesn't seem to mind posing with a whimsy featuring a different dog, which just goes to show you that dogs have a less jealous temperament than cats. I'm sure cats would object to such scandalous ideas. The felt dogs are cut out freehand, so they are all a bit different! A nice addition to the year of whimsies collection, I think. Are there any other animals that you think should grace the veil of a whimsy? 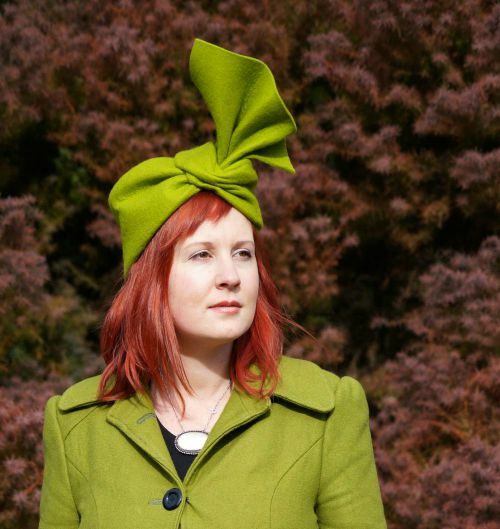 Ethical Millinery: Where Do Hats Fit In To Ethical Fashion? 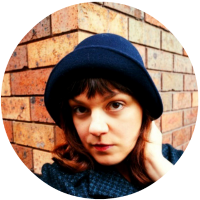 Following on from my post about vintage fashion and ethical shopping, I want to explore how these ideas apply to millinery. I will state up front that I am not setting myself up as an expert and that I am far from perfect in my own habits and choices. 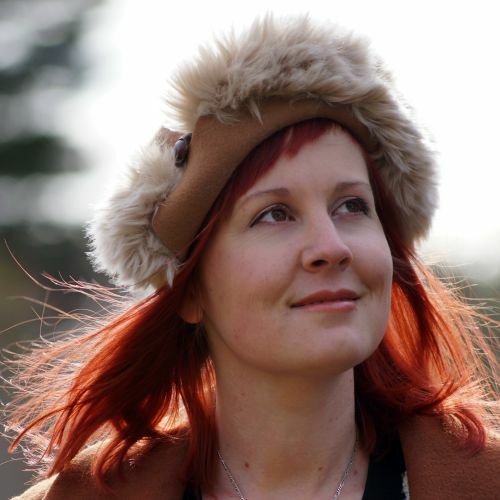 I often consider the ethical side of my making, but I do not always act on it in what I feel is the best way, and I think of myself as still exploring what ethical millinery means to me. This post is a way of sharing some of my current thoughts as I undertake that exploration. Firstly, I think that there are some qualities of hats that make them inherently inclined towards having an ethical place in our wardrobe. Once you are an adult, your head size remains more or less the same. 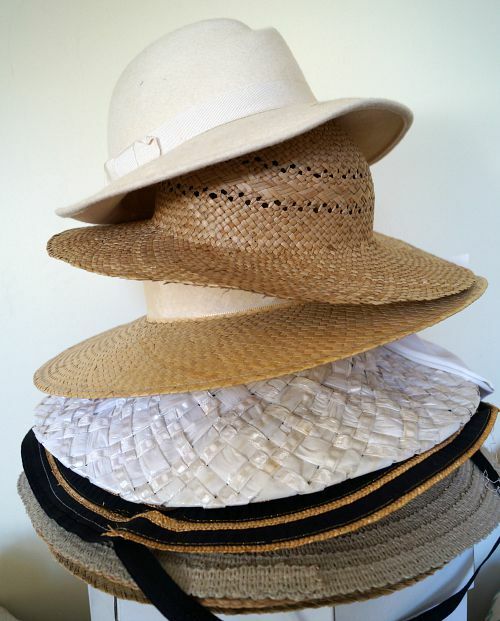 Thus, a hat can be a lifetime fashion investment, reducing wasted buys. This also means that buying a really high quality handmade hat is a more manageable expense - you won't have to do it too often. 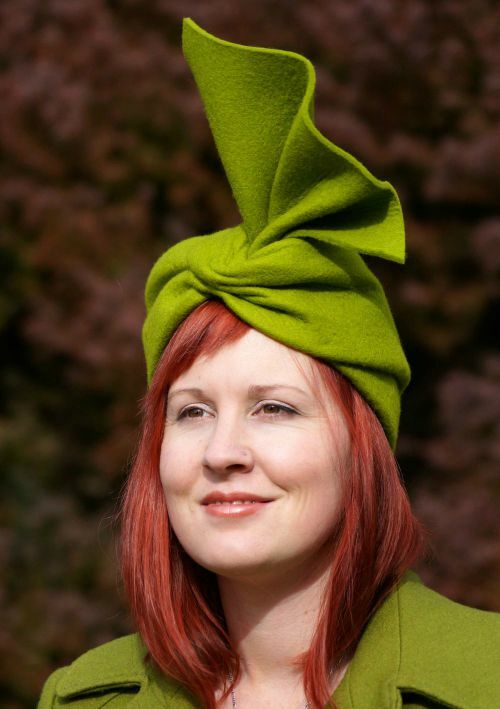 Whether you do this yourself or get a milliner to do it, there is an AWFUL lot that can be done with an old hat. 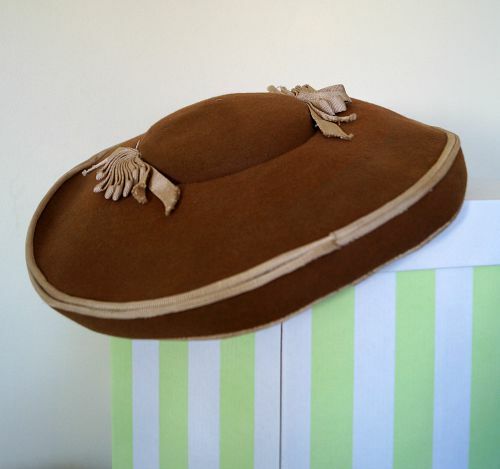 Although the idea of making changes to a vintage hat might be sacrilegious to you, many can be re-blocked to their original shape and cleaned up to give them a longer lasting life, seriously repaired, or have the size changed a small amount without any damage to them. 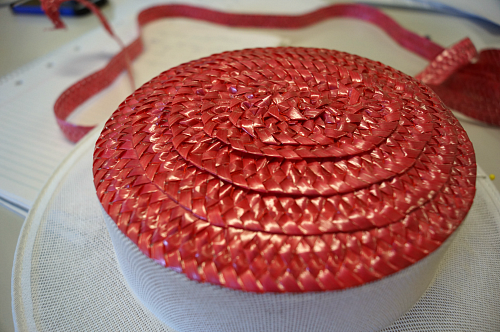 A more modern hat you may have fewer qualms about, and then all sorts of things can be done. Felts and straws, in particular, can be reworked in minor or major ways pretty much ad infinitum. And they should be, in my opinion. A hat should never have to be binned. 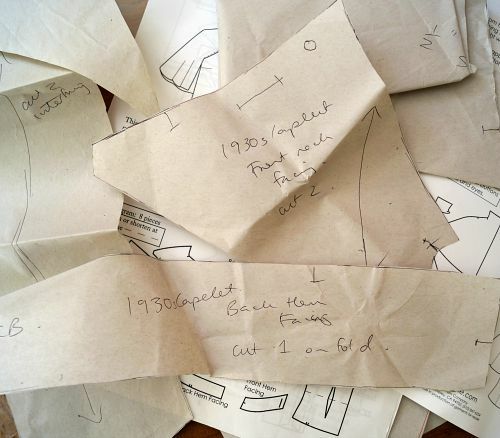 When it comes to embracing "make do and mend" hats are the ideal candidate, and if you want to do this yourself, many of the old millinery texts available (second hand, reprinted or scanned online) have sections on these arts. If this is beyond your interest, most milliners would be thrilled to be a part of a project to keep an old hat alive and kicking. Although there are plenty of cheap mass-manufactured hats out there, they don't outnumber the handmade creations by the same vast majority that exists with clothing. Buying hats that are made by small local industry can therefore be easier for hats than for clothes. 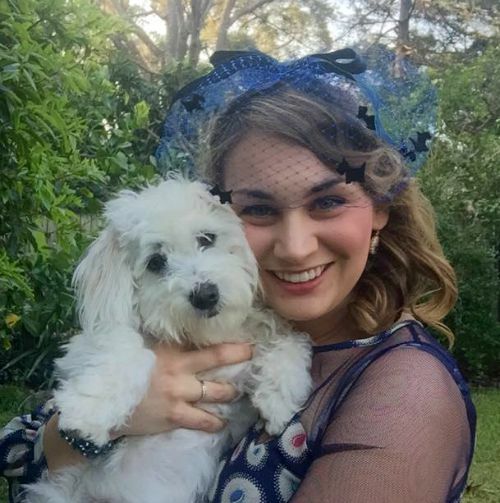 Even the hats you buy from department stores (at least here in Australia) are often made by Australian milliners, and there are many individuals and old traditional manufacturers still in operation. There are also a number of things you can actively choose to do, to keep your hat adventures nice to people and the planet. As with clothes, it is clear that buying vintage or second hand removes our supply chain worries and promotes the mindset in ourselves and in society that these items are not to be thrown away. As mentioned above, milliners and hat makers are around and not hard to find. Their work is diverse and impressive, and you are bound to be able to find the styles you are looking for, or have hats custom made. For everyday hats, think about the clothes you actually own and wear, and the activities you do. Think in winter about something warm and practical, and in summer something that will shield your face and eyes. But think beyond caps and beanies, and use hats as a way to add practical elegance to your wardrobe. 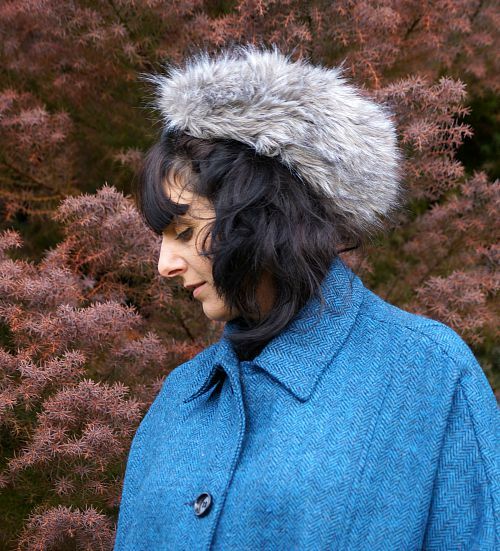 Unless you have a very coordinated wardrobe or a strong signature colour, picking the most versatile hat colour can be hard, but for winter you can match it to your favourite coat (or gloves or scarf) to make sure it will get wear, and in summer natural straw is a neutral that goes with everything. 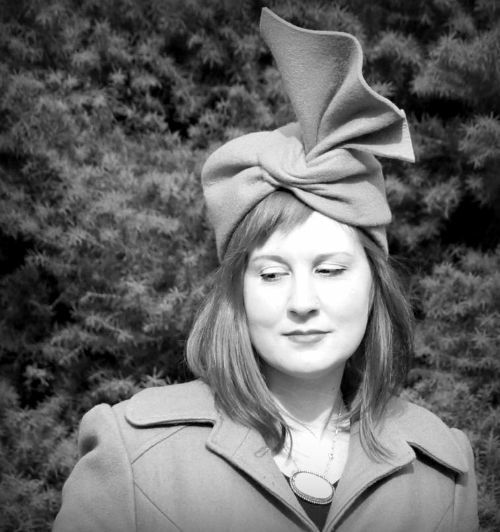 For occasion hats, you may not wear them too often, but make sure you will at least get to wear them once! 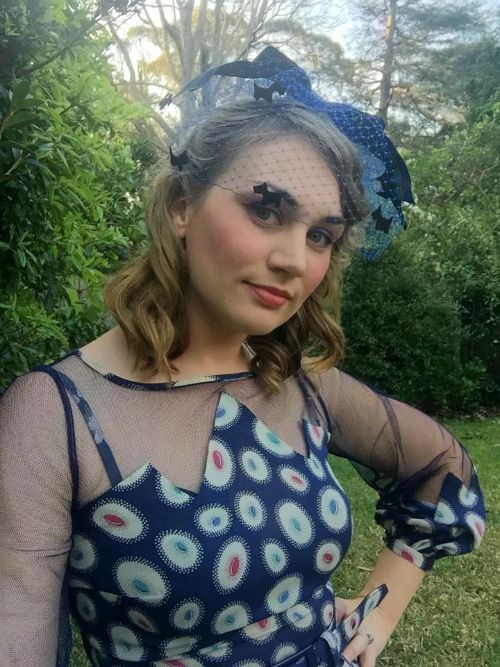 Don't just randomly buy a pretty hat, select one or have a hat custom-made that matches a dress you can wear for evenings out to dinner or the theatre, or to weddings and other special events. When buying new, consider where the material has come from. I'm not going to go into the issues with fur and leather, because, frankly, thinking about it makes me sick. 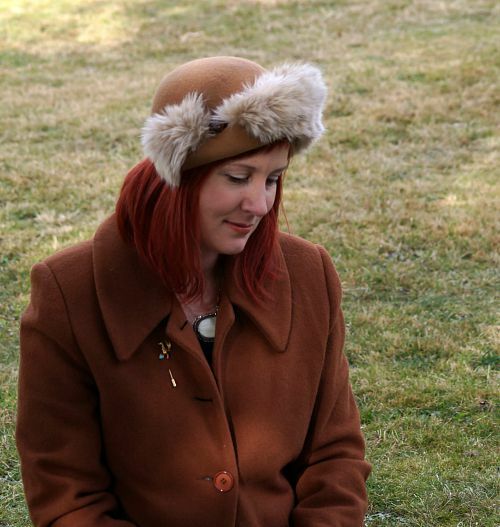 But be aware that many felt hats are made of fur felt, and consider whether that is something you want to get behind. I still find feathers a tricky choice to navigate, but personally I am moving away from them. 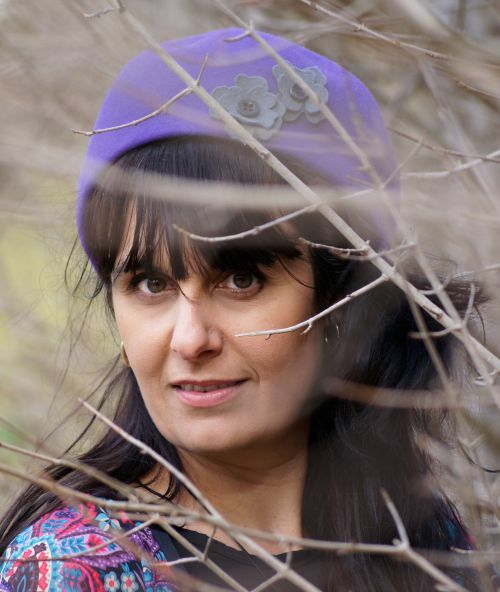 I want to research the manufacture of other millinery materials further, but in general it is easier, if not necessarily the actual case, for plant-based materials like straw and sinamay, as well as wool and fabrics to be sourced in an ethical way. 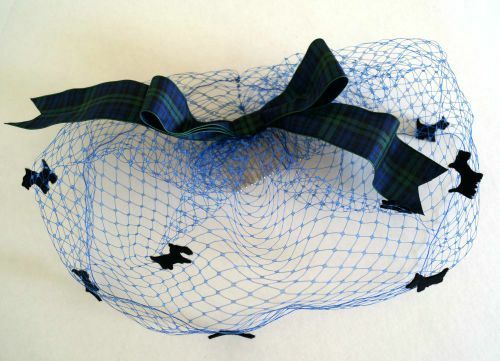 Consider looking for milliners who are working with reclaimed or recycled materials as well. Store them carefully, keep them clean and in shape. There are many ways to do this, and your choices will depend on how often you wear them and the space you have. Find a way that suits your lifestyle, and take into account protection from sunlight, insects, dust and physical damage. Although a hat might fit for life, it won't necessarily suit your tastes and lifestyle for life. 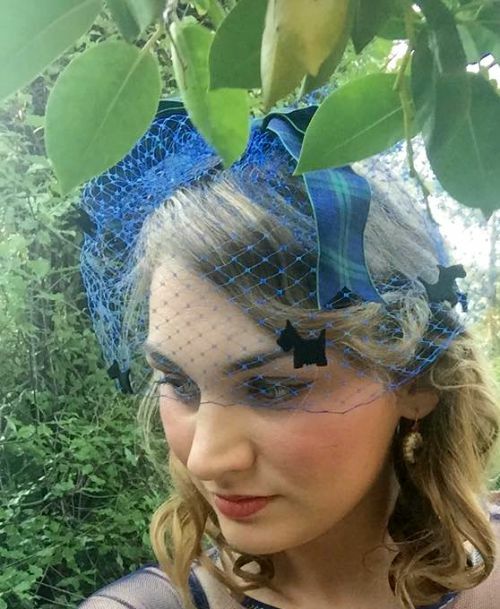 Vintage hats can be resold, donated or given to friends. Hats can be reworked to suit your current needs better (as mentioned above). 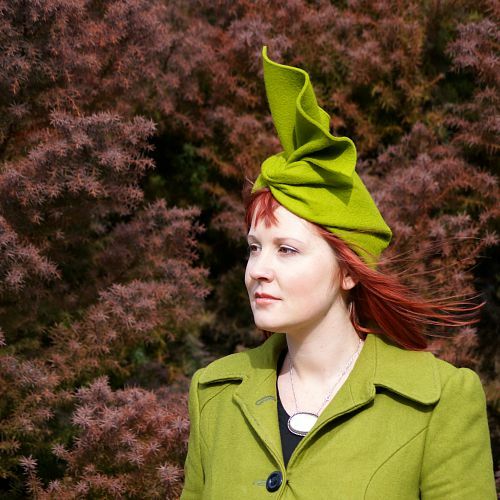 Hats can be donated to friendly milliners who like to recycle, or your local charity shop. I'd love to hear your thoughts on this one! Do you find that you keep hats longer than clothes? 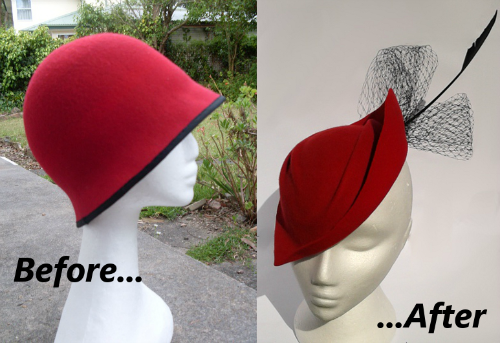 Have you tried your hand at mending or re-working a hat? Today is going to be a picture-heavy post focusing on some hats I've been making and finally taking photos of recently. This was the first version of this style of turban, and it turned out a bit small for me, and also for my model, but you get the idea! This one is made from thermofelt, which I've talked about before. It has the benefit of the bounce-back qualities of that material, but being thinner, it has a less full and lush feel, I think. 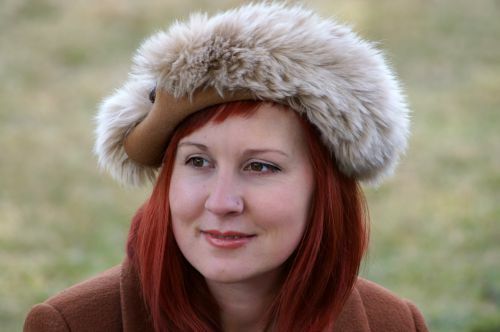 Away from specifically vintage styles, I still think this winter felt hat with faux fur trim has a vintage feel to it. Maybe it's just the way it softly frames the face. 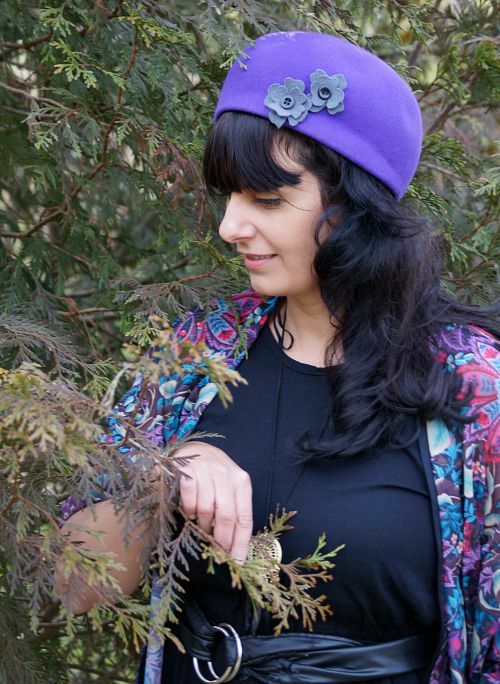 Jasmine just managed to turn up in coats that matched the colours of the hats I brought to the photoshoot! 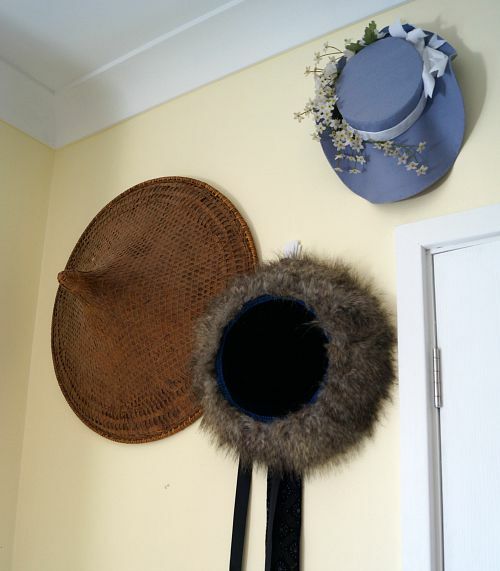 I shared another hat made from this same vintage hat block earlier, but I played with faux fur trim on this one for a different look. My favourite thing about it is how it looks like completely fur from one side, and almost all felt from the other side. I think I will be continuing to experiment with this block. I think I still haven't worked it out to my satisfaction. 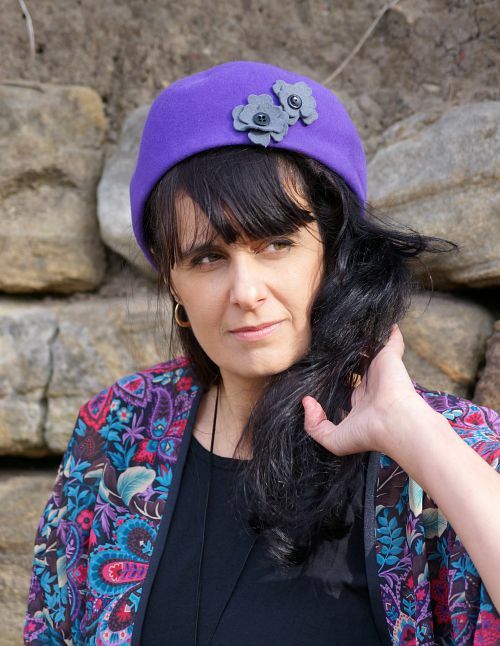 This purple fur beret is also from a block you've seen before, and, again, I'm still working it out. It is a little large and I need to work out how to make that still work for me. Still, I love the colour of this one. I love bright purple in winter outfits. 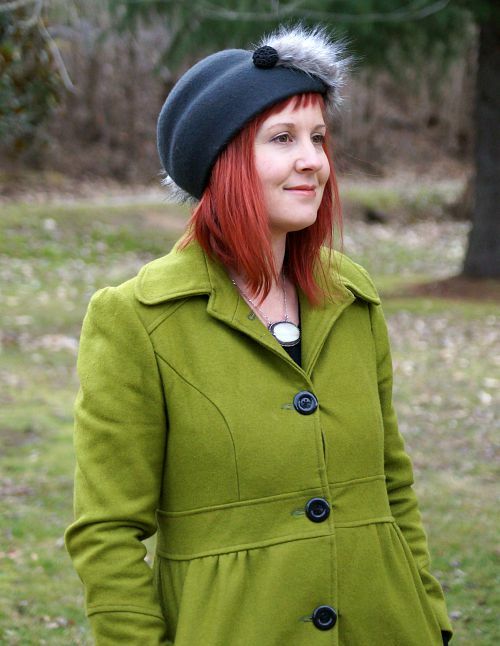 What is your favourite colour and style of hat for winter? Leave me a comment and let me know! I love finding out what people like to wear. 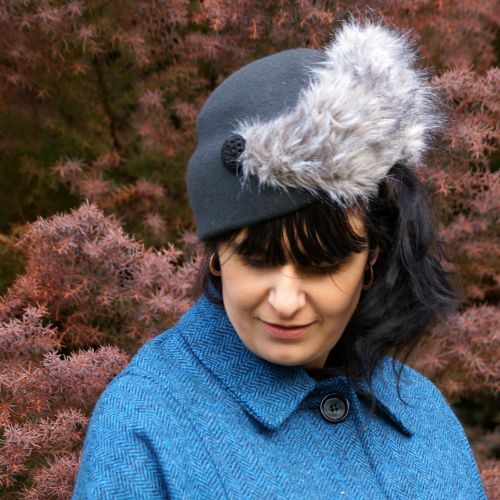 To see sneak peeks of my new hats as I'm making and photographing them, as well as other behind-the-scenes info and useful hat-related links, sign up to the newsletter. Four years ago, I read Lucy Siegle's "To Die For: Is Fashion Wearing Out The World" and my exploration of ethical fashion began. 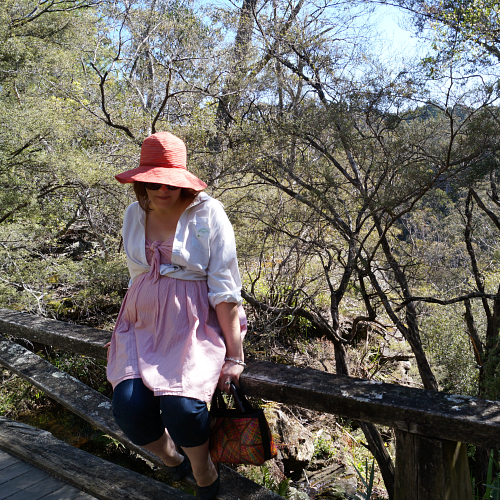 I haven't talked much about this on my blog, although you may have gotten a sense of my passion for recycling materials through my hat makeovers and use of old clothing for fabric. Recently I re-read "To Die For", and then watched the documentary "The True Cost", and I have strengthened my resolve to change the way I relate to my clothes. I'm not going to argue the importance of ethical fashion. That would be beyond the scope of my entire blog, let alone one post. If you need convincing, read To Die For (or I believe "Overdressed" by Elizabeth L. Cline is a very similar book with an American viewpoint), or watch "The True Cost." What I am going to talk about are some specific thoughts I had about how vintage fashion fits in. Having an ethical approach to your wardrobe comes down to how you shop, how you look after your clothes, and how you dispose of them. 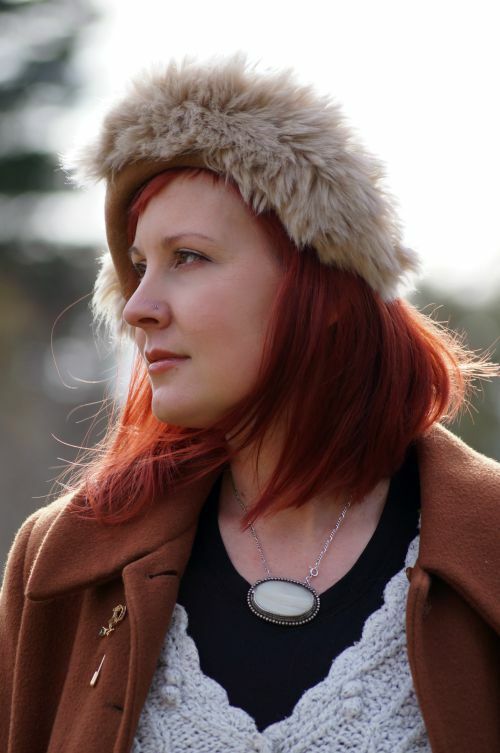 Wearing genuine vintage clothing and being a part of the vintage fashion scene doesn't automatically convert you into an ethical fashion hero, but it can provide you with skills that allow and even encourage you in ethical fashion habits. This is the obvious one, and the only one really discussed in the ethical fashion literature. Buying vintage means you aren't supporting the fast fashion machine. But it also gets you into the habit of looking beyond the shopping centre for your clothing purchases. You turn to vintage shops, online and in person, but also op/thrift/charity shops, Ebay, clothes swaps etc. Just being open to these options can make you a more ethical shopper, even when you aren't shopping for vintage. 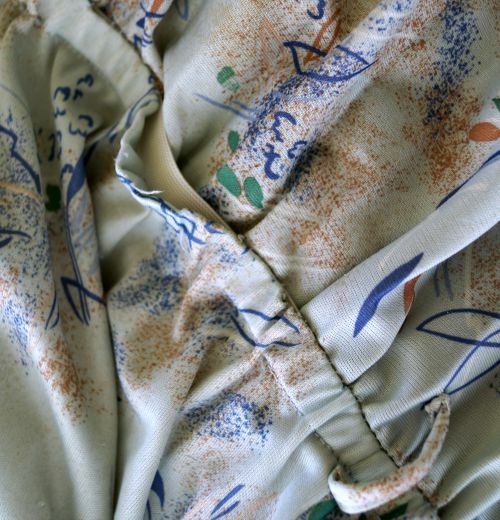 Vintage shopping encourages an awareness of textiles. 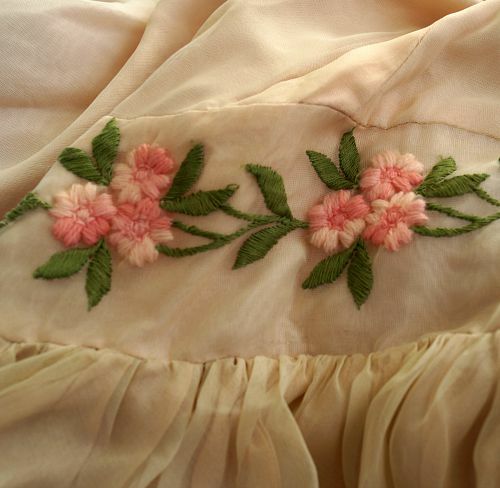 They tell you the quality of the item, the care it will require, how well it will last, and can help tell a genuine vintage item from a later item "in the style of". This awareness can help you be an ethical shopper too. You know that there are both natural and man made fibres that have a similar appearance, and you know to check and find out which it is. You can make sensible decisions about buying a fabric that will wear well for many years, and that has a lower environmental impact. 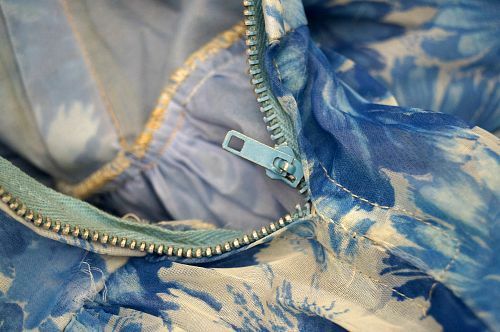 Buying vintage often means that buttons need to be resewn or popped seams repaired. So you've probably gotten used to the idea, and it is an accepted part of your life. Sometimes clothes need to be mended. This is an important part of an ethical approach to clothes in general. You are willing to make the effort to keep your clothes wearable, rather than just throwing them out as soon as there is anything wrong with them. 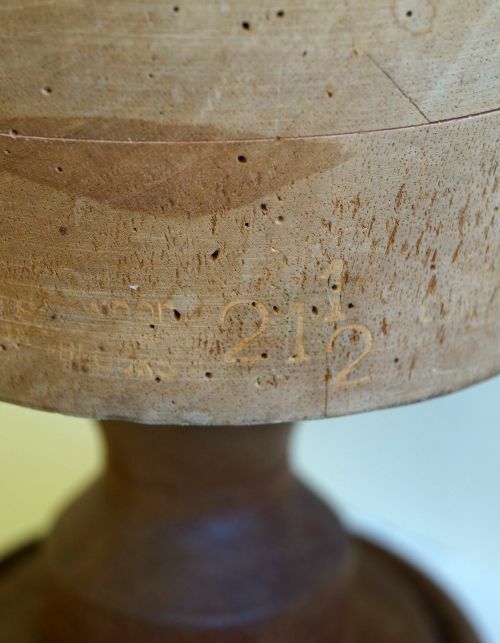 Indeed, it may take a more serious flaw for you to consider something as really damaged, too, because you have gotten used to the idea that one small flaw or mark on an item isn't in fact the end of the world. Whether you do it yourself or pay to have it done, you have probably at least considered having some changes made to your clothes. Maybe a hem taken up, zipper replaced, size adjusted, or a new lining inserted. Naturally, these same tactics can keep all of your clothes wearable for much longer, and help you get the most life out of them. 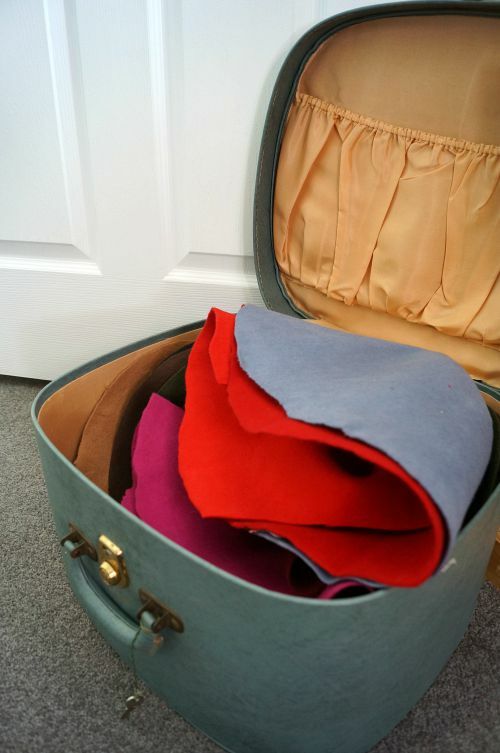 You can also make the most use of your second hand shopping, clothes swaps or hand-me-downs this way too. This may be a stretch, but compared to the average person, it seems like those involved in the vintage fashion scene are often very crafty. And the temptation to join those vintage lovers who are making their own amazing dresses, skirts, blouses and even jeans is very strong! And those patterns everyone keeps posting, with their swoon-worthy illustrations? You know you want to. Which of course opens up a world of ethical options, and improves your ability to alter and mend your clothes too! You can appreciate the handiwork and you enjoy the specialness of clothes. They are not just a throwaway item for you. That detailed embroidery? You know how many hours it must have taken, and that it makes the item more valuable. This opens the way for you to be aware of what clothing should really cost. When you see that detailed embroidery on a new item for $20, you might stop and think about how it got there for that price. That clothing, especially wearable clothing, ends up in landfill, is an appalling part of our modern life. Being used to buying clothes that have worn before, you know that unless something is really really dead, someone else will probably want it! But what are the possible downsides? Again, these aren't necessarily true for every vintage fashionista, but they are things to be cautious about, or consider. And I'm not saying that you should change your behaviours, just make sure you've given these things some thought. It's a plus and a possible minus. You may not be supporting the fast fashion machine, but you also may not be supporting the slow fashion makers and innovative eco and fairtrade companies. That's ok, there are plenty of buyers to go around, I guess, and you certainly don't have to change the way you like to dress and shop. It might, however, be worth checking out some of the companies that are making big positive changes in the fashion world, just to see what they are doing. If you make your own clothes, you might get some serious inspiration! If you are hardly ever buying new clothes, it might be easy just to say "Oh I wear vintage, so that isn't my problem." So when you do need something new (maybe underwear or sporting clothes or pyjamas or something else you don't buy vintage), you aren't aware of the ethical issues. Without facing them frequently, it is easier to remain ignorant of them. 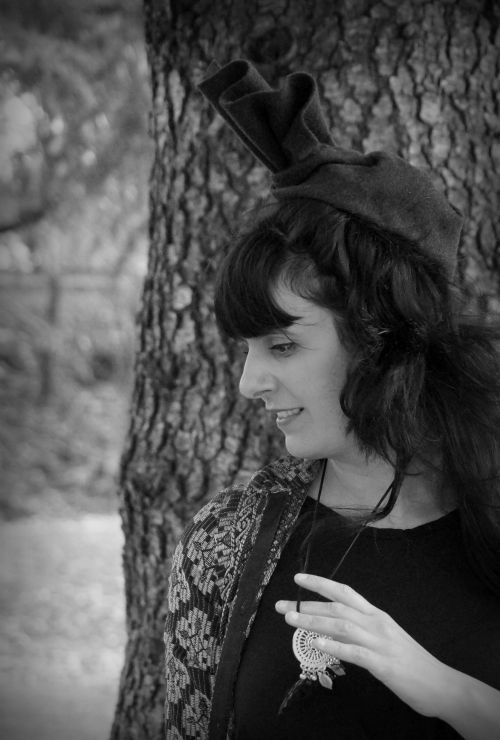 Ethical fashion isn't just about buying clothes with an ethical back-story. It's also about our unnecessarily high consumption. And we all know the blogging world is full of beautiful images of people wearing amazing clothes, and these images make us want ALL THE CLOTHES. 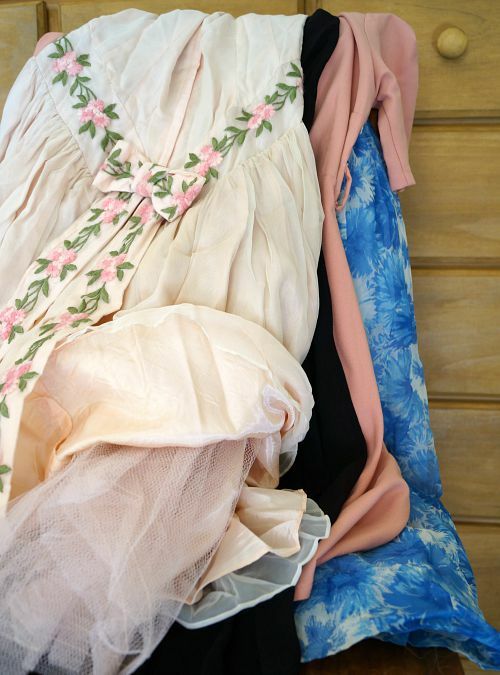 All the pretty dresses we never need to wear. A totally new outfit no one has seen for our blog pictures. 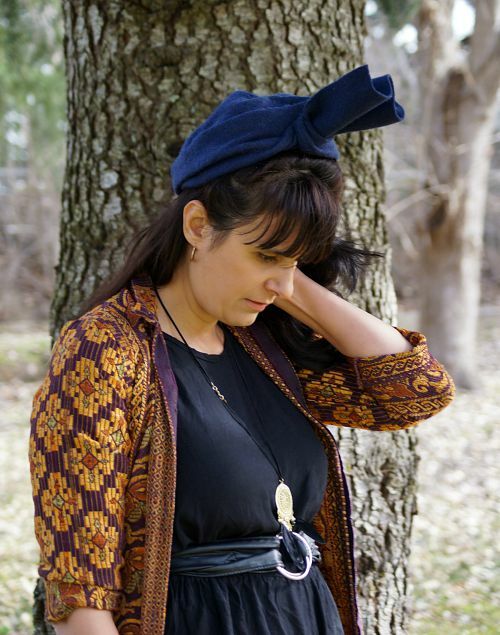 I know that I personally love to see bloggers wearing the same clothes again, especially if they have changed up the combination of separates, the accessories, or the styling. 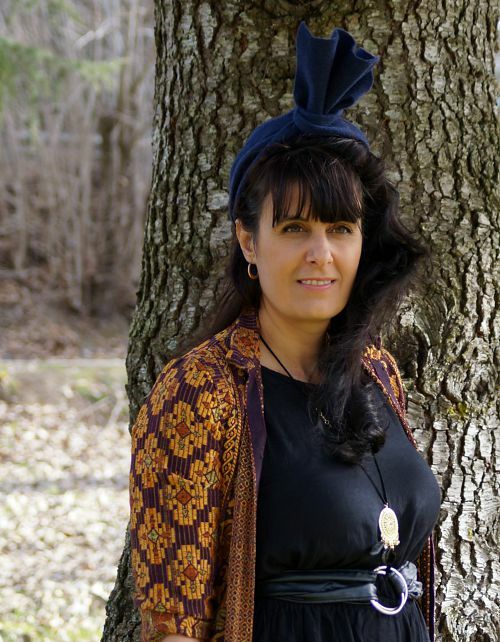 It shows your readers the versatility of the items in a real way, and actual wardrobe inspiration that is more applicable to their lives than just a desire for more clothes (that maybe they can't afford anyway). I would love to hear your thoughts on these points! Do you agree? 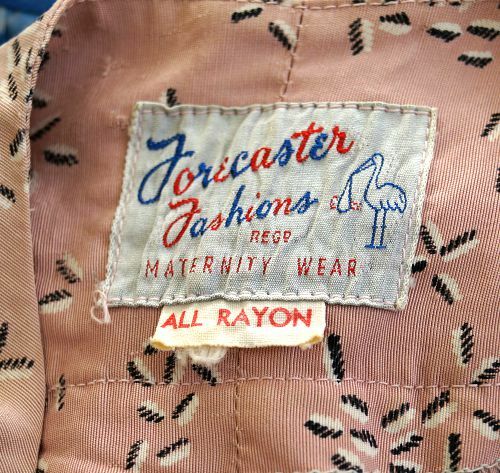 Can you think of any other ways that a love of vintage inspires or helps a relationship with ethical fashion? Don't forget the newsletter, if you haven't signed up already. There are new products going into my Etsy shop this week that you'll hear all about!